There are a number of techniques that divers can employ to safely conserve their air supply. Here we highlight some of the best. Naturally we want our scuba diving adventures to last as long as possible, but as an activity limited by air supply there’s precious little we can do beyond developing gills. Nevertheless, there are at least many techniques to preserve the air supply, so that we can extend bottom time and make the most out of a scuba dive. The most important factor in saving air is relaxation. If you are stressed or anxious during your dive then you can easily consume two or three times the amount of air than in a relaxed state. 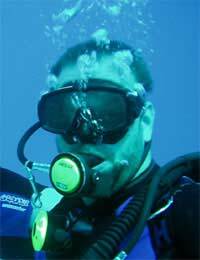 Novice divers typically consume more air because in their inexperience they are naturally more apprehensive and ill at ease in the water. In relaxing you should try to breathe normally both on the surface and when underwater. Once you have your gear on you should try to get underwater as soon as possible, because the awkward scuba equipment will then feel more comfortable and natural, thereby making you feel less stressed. On the descent, it helps to exhale all the air from your lungs so as to release any build up of tension. When swimming around underwater, try to keep you movements slow – scuba diving after all is supposed to be a relaxing, meditative activity not a speed sport. It will also help to try to maintain a slow but deep breathing rate. This will give a more efficient gas exchange in the lungs. How relaxed your body and mind are when undertaking a dive will also depend on how rested you are both mentally and physically. A key factor in keeping you in a good physical and mental state is to stay fit. Try keeping fit with a proper training program that includes cardiovascular and weight training exercise. Also, keep away from cigarettes. With your respiratory and cardiovascular systems in excellent form, your body will work more efficiently, which means better air use and greater time underwater. Another important factor in maximising your air supply is the fine-tuning of your weight system so that adjusting your buoyancy will be easy. If you are weighted properly and holding a normal breath then you should float at eye level. If you then relax and exhale completely – ensuring that all the air is emptied out of both your lungs and BCD – you should slowly sink beneath the surface of the water. When altering you buoyancy, you should use the BCD inflator carefully, using only short bursts of air at a time, and checking progress between each. By maintaining a good weighting system you are reducing the amount of air consumed by constantly adding and dumping air unnecessarily. If you can manage to stay neutral with very little effort, you are more relaxed and your tank will go further. To save unnecessary energy use it is vital to reduce drag by staying streamlined in the water. The ideal technique is to swim in a horizontal position with your arms by your side and employ slow smooth kick strokes that begin at the hips. You should also ensure that there are no instruments dangling from your body that would impede your swift movement through the water. With water around 800 times denser than air, you naturally burn up a lot of energy swimming through it. To improve energy, and therefore air, efficiency it is sensible to minimise your activities in the water as much as possible. At some points, for instance, you could avoid swimming altogether by taking advantage of underwater currents. Also you should limit multitasking. If you are trying to studying marine life, take photographs and make notes then you will likely be using up more energy than you would focusing on one activity. As we are put under greater pressure the deeper we go in the water, we are consuming more air with each breath. It therefore makes sense to stay in shallower waters when possible.